If you’re working on a project that involves installing new flooring, you will more than likely need to choose a cove base or skirting that works with your application. There are quite a few options from which to choose, and I will cover some of them for you in this article. In most homes, hardwood or laminate trims are typically used. These can be stained or painted to match the surrounding décor. You can purchase these in different wood types, shapes, and sizes from your local hardware or DIY store. These trims can be a simple wooden trim or a sculpted ornate design. If you want to have something totally unique, you can contract with a craftsman who specializes in woodworking and have custom trims done to your exact specifications. These, of course, would be more expensive than the standard “off the shelf” types of trim. Although the floor trim serves a purpose of transitioning from the floor to the wall, in your home, it’s more about aesthetics than usefulness. Why do you need cove base? 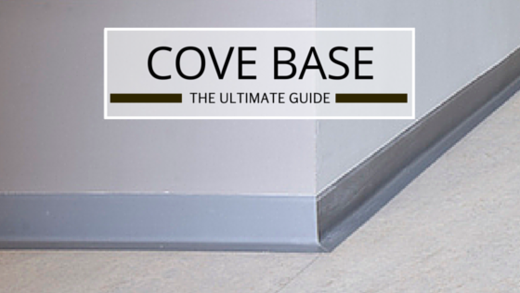 For commercial applications, a cove base, or "skirting," serves many different purposes. You may have an area that is used by carts, wheelchairs, or other rolling equipment. Especially in commercial environments, walls are susceptible to damage and cove base can help protect the base of the wall from damage by this equipment. Set-In Cove Base – Set-in cove base comes down the wall and onto the floor, butting up to the product that is being used on the floor. When the set-in cove base is welded to the floor covering, an impervious seal is created. In areas that are subject to regular wet cleaning, such as hospital treatment areas or certain manufacturing areas, this is very important. Sit-On Cove Base – Sit-on cove base comes down the wall onto the floor covering, adding a slight ramp at the end of the cove base which creates a neat finish over most hard floor coverings. Flat Cove Base – Flat cove base is generally used with carpet or carpet tile. The cove base comes down the wall and ends just as it reaches the floor. 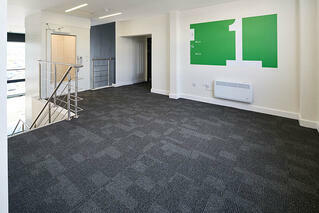 Gradus has a full range of PVC cove base profiles (skirtings), as well as a line of metal cove bases. There are benefits to both types of cove base materials. PVC profiles come in a wide range of colors, so there’s a good chance you will be able to match or compliment your color scheme with a PVC cove base. PVC profiles give maximum performance with little maintenance. Some PVC cove base profiles can be purchased in coils, which minimize the number of vertical joints needed. This is particularly important in places like food preparation or clinical treatment areas that would require that horizontal and vertical joints be welded. PVC profiles are available in different thicknesses to suit various types of resilient floor covering. PVC cove base profiles can be easily cut on site to form corners. Metal cove base is available in a variety of finishes including stainless steel and aluminum. Gradus metal cove base profiles are available in a variety of designs and heights to suit the requirements of modern commercial environments. Metal cove base can be purchased in the “slimline” range, which is similar to a traditional PVC cove base. It comes down the wall and over the floor covering. Or, if you need to hide low voltage (computer or telephone) cables, you may want to use a two piece Interlocking Aluminum profile. Pre-cut corners and junction caps are available for metal cove base profiles, so no fabricating is needed during the installation. In some cases, you may decide to use the floor covering as the “cove base” by running it up the wall and finishing it off with a capping strip. If this is what you have in mind, Gradus has an extensive range of PVC, PVC-u, and aluminum capping strips, cove formers, and accessories that can be used in this type of installation. 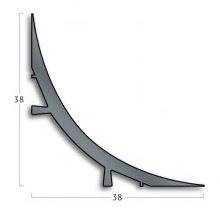 These types of profiles can be used with carpet, resilient floor coverings, and ceramic tiles. Capping Seals – Flexible PVC capping seals are used to finish the top of a resilient floor covering where it has been coved up the wall. Capping seals are usually used in conjunction with a cover former. Carpet Caps – Carpet caps are used to provide a neat finish where carpet or carpet tile is continued up the wall. These are available in several colors of PVC-u, Metallic PVC-u, and Aluminum. Carpet caps can be combined with a cove former where required to help form a cove. Tile Caps – Tile caps are used where ceramic wall tiles are finished against a resilient floor finish that has been coved up the wall to form a skirting. 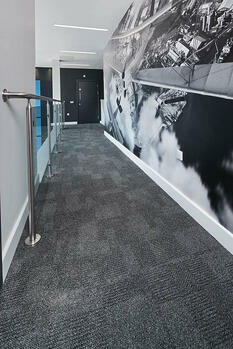 Cove Formers – Cove formers are used to form a cove where floor coverings are continued up the wall. Cover formers are usually used in conjunction with a capping seal or carpet cap to finish the raw edge of the floor covering. You can also purchase a one-piece cove former that continues up the wall and ends with a PVC capping seal. Hopefully, this will give you a general overview of options and ideas for your cove base needs. You may download our latest catalog or contact us for more information.